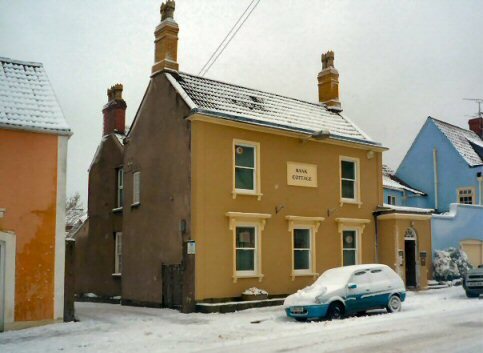 The photograph above is of Bank Cottage in Castle Street, Thornbury which is now the home of a dental practice. The Tithe Map shown below on the right was drawn up between 1837 and 1840 and says that this was plot number 271. The apportionment that accompanies it shows that it was a surgery and a yard owned and occupied by Thomas Fewster. Thomas was a surgeon and apothecary and he lived at nearby Wigmore House but he had a surgery in this house. Thomas appears to have inherited the property from his more famous father John Fewster. We cannot explain how this happened at present. We believe that this property was referred to in the will of John Fewster drawn up in 1820 as “my messuage or tenement lately erected by me, now or late in the occupation of Mr Hunt.” This property was left to John Fewster’s daughter, Elizabeth Player. We know that Elizabeth’s son John Player was a surgeon and that he died in Manchester in 1836 and so it is possible that Thomas Fewster acquired the surgery at Bank Cottage either after John Player junior died or went to Manchester. The Savings Bank in Thornbury was set up as part of a Savings Bank movement which appears to have begun in 1810 with an attempt by the Rev Henry Duncan of Ruthwell in Dumfries to help the poor. The plan was to encourage thrift by providing a safe means of investing money for a good rate of interest. Banks at that time required a minimum deposit of £10 which at this time was a substantial sum. Thornbury Savings Bank shared the ideals of the new Savings Bank movement and its rules make it clear that it was set up “for the purpose of affording the industrious and labouring classes, whether minors or of age a secure institution for such sums of money as they may be able to deposit therein.” The minimum deposit in Thornbury was one shilling (5p). The movement spread quickly all over Britain and it is no coincidence that the Gloucester Records Office holds the records of ten banks in Gloucestershire that were set up at the same time as the Thornbury Savings Bank. Amended rules of the Savings Bank were drawn up on 22nd December 1818. They listed the trustees at that time. These were Samuel Peach Peach, William Norris Tonge, John Mair, George Alexander Fullerton, Gabriel Goldney, Rev William Davies, Rev Richard Slade, John Brickdale Ward, John Fewster and William Cowley. The rules were later revised in 1824 to deal with the problem of who inherits the money in the savings account should a depositor die. The money had to paid into the bank at the actuary’s office. The first actuary of the bank was James Eley and his name is mentioned in the original document called “The Rules of the Savings Bank” which was drawn up on December 27th 1817 which constituted the bank. At this time we cannot be certain where Mr Eley’s office was, although he lived and had his shop at 1 The Plain. By 1842 we have evidence that Richard Scarlett was the actuary for the Savings Bank, although he may have taken over much earlier as James Eley died in 1831. The post of actuary of the bank seems to have been a very part time occupation. James Eley was described as a draper in his will and this appears to have been his main occupation. Richard Scarlett was an attorney but his other posts included registrar, fire office agent, Steward of the Manor to name but a few. The rules of the bank make it clear that the bank was only open on Monday mornings between 10am and 1pm. The 1841 census showed that 14 Castle Street was still being used by George Fewster who was a surgeon and who had inherited the property and the practice from his father, Thomas Fewster. The trade directories indicate that it is likely that George continued to practice in Thornbury until about 1851/2. However we have reason to believe that the building was used by the Savings Bank from 1842. A sale notice of 30th January 1890 refers to the fact that the property was leasehold for 990 years from 24th April 1842, which was possibly the date on which it began to be used by the Savings Bank. The leaseholders were probably members of the Fewster family. The 1851 census shows that George Fewster was living in Wigmore House, he was probably no longer using 14 Castle Street as his surgery. The census now describes this property as the “Savings Bank” and says that it had a resident housekeeper, Susanna Trayhurn a 40 year old spinster born in Thornbury. Susannah Trayhurn was probably born on 26th January 1797, the daughter of Thomas and Susannah Trayhurn (or Trayherne) nee Pitt. Susannah’s mother died in November 1805 aged 35 when Susannah was eight years old. Her father remarried in 1807 to Ann Walsh. 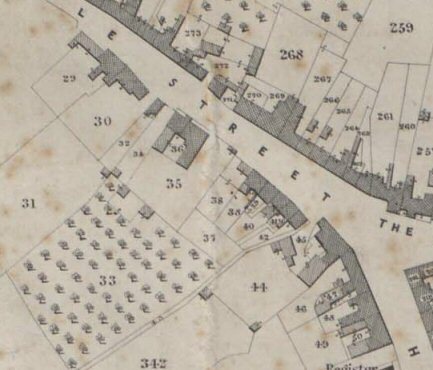 The 1841 census shows that Susannah was living with her father Thomas Trayhurn at 19 High Street next to the Swan public house. Thomas Trayhurn was a parish clerk. Susannah’s age was given as about 40 and her brother Joseph Trayhurn was about 45. Joseph was a tailor born on 9th March 1792. Also living with the family was Ann Britt, a seamstress. Thomas Trayhurn died on 5th May 1847 aged 82. Ann Britt and Joseph Trayhurn went to live at 12 Pullins Green with John Thatcher and his wife Hester. Joseph was John Thatcher’s uncle and Ann Britt was Hester’s mother. Susannah must have got a job as a housekeeper at the Savings Bank so she could have a home. The censuses seem to indicate that Susannah Trayhurn was less than open about her age. In 1851 the census showed she was 40 years of age. The 1861 census gives her age as 44. In 1871 the census said she was 80 years old. Susannah Trayhurn died in 1872 aged 81. 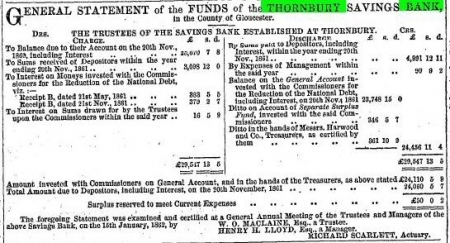 Below is an extract from a newspaper of 25th January 1862 which shows the balance sheet of Thornbury Savings Bank. This tells us that Richard Scarlett continued to be an actuary of the bank and that Henry Lloyd was the bank’s manager. From 1859 the rate books confirm that the building was owned and used by the managers of the Savings Bank. However it is not clear why it is necessary to have bought the building as the 1868 Trade Directory of Gloucestershire (which says that Richard Scarlett is still the actuary) confirms that the bank is continuing to open only on Mondays and only from 11am to 1pm. Richard Scarlett died in 1881. It is likely that the next actuary was Thomas Harney who was an accountant and Registrar. Thomas was still listed as the actuary in Wright’s Trade Directory of 1891 after the Savings Bank had closed. A notice advertising the sale of Bank Cottage appeared in the Bristol Mercury of 30th January 1890 (see below). On February 8th 1890 a newspaper report in the Bristol Mercury explains the reason for the sale and the change of ownership. Looking at the newspapers of this period, we feel that the explanation for closing the Savings Bank may only be partly true. The Post Office Savings Bank began to operate rather earlier than this. It was set up on 16 September 1861 to encourage ordinary people to save money safe in the knowledge that it was secured by the government. It also provided the government with a financial asset. Over time it introduced a range of other services and by 1880 this included government stocks and bonds. The other aspect of this was that the Savings Banks were set up to reassure working people that their money would be safe. However in 1886 newspapers all over Britain, especially in Wales and Bristol, carried a series of stories about the problems of Cardiff Savings Bank. After the death of James Emerson Williams who had been actuary for 30 years it was discovered that there were two sets of books which had concealed his embezzlements over a long period of time. As the enquiry went on it became evident that £37,000 was unaccounted for. This was brought to public’s attention in an article of January 11th 1890 in the Bristol Mercury. A less dramatic but also well publicised case occurred with the Savings Bank in Macclesfield in 1889 and this coincided with articles about the legal battles of creditors of the Cardiff Savings Bank, who were trying to recover the money from the Savings Bank managers. A report that several thousand pounds had disappeared from Chelsea Savings Bank also featured in the Bristol Mercury in January 1890. It is noticeable that around this period the Bristol Savings Bank had a series of reassuring articles in the newspapers showing the sound basis of the bank and publishing its accounts. This does suggest that the publicity was making both the investors and the Savings Bank managers uneasy. In 1890 the rate book indicated that J.C. Gwynn had bought the property which was inhabited by Mary Ann Salmon. This change of the use of the building is confirmed by the 1891 census which describes the house as the “Old Savings Bank” and shows that the 77 year old Frances Salmon was then living in the house with her daughter Mary Ann Salmon aged 52.